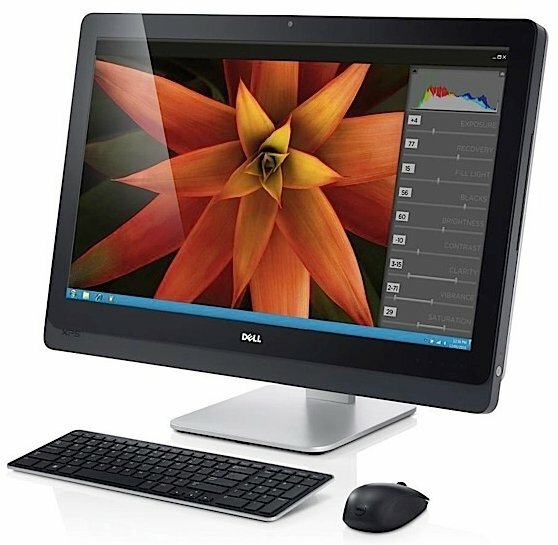 Dell introduces three new All-in-One PCs; the 27" XPS One 27, the 23" Inspiron One 23 and the 20" Inspiron One 20. Dell is reimagining the all-in-one computer with a new portfolio of solutions for consumers who desire beautifully designed systems for multimedia creation and entertainment. The new computers include the XPS One 27, Dell’s largest ever all-in-one and part of the premium XPS performance family, and the Inspiron One 23 and Inspiron One 20 all-in-one computers for families. The three desktop computers are slim and stylish and reflect Dell’s design aesthetic that places a premium on unique materials, form factors and experiences. The XPS One 27 delivers a big-screen experience – from the diagonal to the resolution – with one of the most vibrant displays Dell has offered. The XPS One 27 is 27-inches of stunning 2560x1440 Full Quad HD clarity and color. The wide format 16:9 WLED display makes digital work, movies, games and photos appear crisp, colors vivid. It delivers optional high-performance graphics from NVIDIA and entertainment features such as Waves MaxxAudio 4 and Infinity-branded speakers, an optional slot load Blu-ray disc drive, and optional internal TV tuner, making it an entertainment and multimedia powerhouse. The gorgeous design extends beyond the all-in-one PC’s vibrant display. The combination of a slim, space-saving metallic silver color housing, “clutter-free” one-cord design, and wireless keyboard and mouse, ensures the XPS One 27 is a beautiful addition from any angle to any room. On the inside, Dell packs 3rd Generation Intel Quad Core processors with Intel Turbo Boost Technology, balancing quad core processing with efficient power use – even while running multiple programs at once. With an optional mSATA SSD drive and Intel Smart Response Technology, and four USB 3.0 ports, the XPS One 27 delivers a noticeable speed boost on start-up, resume and data transfer. Inspiron One 23 and Inspiron One 20: Big Value, Minimal Space Featuring a simple, single cord set-up, the new space-saving Inspiron all-in-one computers make life easy and deliver powerful entertainment for the whole family. The latest Intel processors and optional powerful discrete graphics allow parents and kids to stay connected to each other and to enjoy the things they love, such as music, movies and casual gaming. A result of direct customer feedback, the Inspiron One 23 now features a new sleek pedestal stand that supports a Full HD 1080p WLED 23-inch display. With an optional Blu-ray disc drive and optional internal TV tuner, as well as ample storage for music, movies and photos, the Inspiron One 23 is an attractive addition to the family living room. The Inspiron One 20 delivers everyday connectivity and computing in a clean and simple design, making it a smart investment at a competitive price. The all-in-one PC provides a clutter-free work area with full desktop-equivalent performance, allowing customers to stay organized and efficient and keep up with family and friends. The XPS One 27 (starting at $1,399), Inspiron One 23 (starting at $749) and Inspiron One 20 (starting at $529) all-in-one computers are available today in select countries in Asia and will be available in the United States and additional countries in the coming weeks.